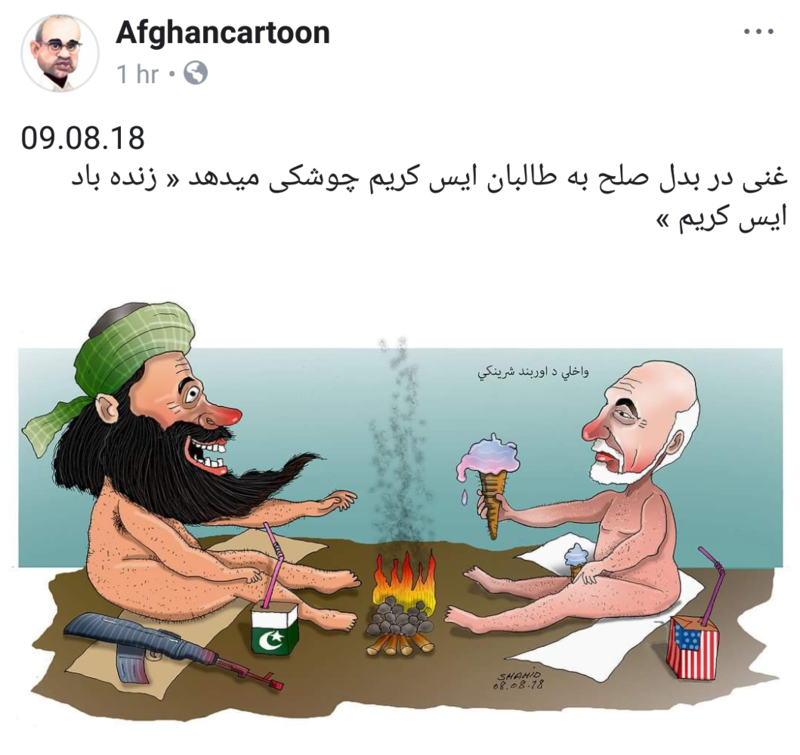 Political commentators and cartoonists are taking aim at President Ashraf Ghani’s recent comment about offering ice cream to the Taliban. Is there any honor in its deadly provocations of ethnic groups against each other ????? I agree with Shafie Ayar, Ghani is clearly on some sort of drugs. He says the weirdest things. Hopefully, he will be voted out in the next elections. Yes; they are all Thughs and Thugh-Mars- they, both, servicing their Anglo/US MASTERS. what this semi-retard is preaching. Afghanistan- they all perform their evil duties according to the written scrips of the same war criminals. I thought you were going to stop posting? I still see dozens afterwards… by the way, this isn’t a forum, but a news page. Are you against freedom of speech? I said I was going to stop writing if they keep posting crazy Ayar’s videos- really, I don’t have time to provide infos for unappreciative readers. THOSE WHO ARE AROUND YOU. This news bulletin was used as a discussion forum for a long time before it got expanded into more news media outlet for the last few years; but anyway, they always had an additional discussion format for personal opinions as well.. I am %100, for the freedom of speech; but, this low-class man is preaching hatred. If you need more elaborations, I could easily pinpoint and prove it to you. HE IS NOT, JUST TACILY APPROVE VIOLENCE; HE CLEATLY, DECLARED IT. this semi-retard stooge is saying. MASTER- AS THUG AND THUG-MAR. in an order to humiliate and down grade the culture and the people of Afghanistan. have any real civilized remedies other than to encouraging the ethnic groups fight each other- and for no real honorable cause. You nutballs are posting all kinds of weird news with no reservations-.